"This book is weird, and I mean that in the most complimentary way possible." "Only a true dog lover could have written this marvelous book. By setting the story in a dystopian world where real dogs are no more, its artful storytelling makes the best possible case for treating dogs well, as that is what they so richly deserve for giving us unconditional love like no other creature on this earth. This book will make you smile and give your real-life canine extra hugs, and really, what could be better than that?" "Our most anticipated indie YA." "Skirts the line between science fiction and speculative fiction . . . a unique story well-suited to reluctant readers." "The novel explores the gap between human intention and impact . . . A provocative reflection on humanity's increasingly damaging effects on the natural world." "A thought-provoking story line . . . Quirky details and imaginative tech characterize the simultaneously futuristic and off-the-grid environment of Dog Island." "There is no putting down this fun, quirky read." "An unusual, quirky book with unexpected twists and turns." "One of the most thought-provoking books I have read this year . . . [an] engrossing tale that, while exploring brutal actions, ends in a way guaranteed to warm hearts." "A really fun book about hope and discovery." "It's an intense read, sure to leave an impression, and readers will likely have difficulty getting Dog Island out of their heads." "This book definitely creates an interesting philosophical conundrum. Readers will enjoy Greenwood tackling ethical dilemmas around life, suffering and what it means to take care of the world around us." "A very unique approach . . . suspenseful and exciting!" "Fast-paced and entertaining . . . Arin has a deft touch." "A meaningful read for teens and adults of all ages." "I loved the book! It's so well done—I was hooked from the get-go. Plus, if you're conversant with the world of animal welfare, it's hard not to see Your Robot Dog Will Die as a gripping allegory." —Duncan Strauss, host of "Talking Animals"
"It is a great read, and she is a brilliant writer." "It’s a perfect beach read . . . It poses a humongous question: What is suffering? But author Arin Greenwood delivers her response in a funny, thought-provoking, and quick-moving novel." "This novel is a perfect choice for animal lovers, adventure lovers, and those who enjoy books with unique plots. Anyone who rescues animals? It’s a must-read!" "Robot Dog weds sci-fi adventure to a heart-tugging human/canine love story, and the result is an unforgettable read. I adored this book and couldn’t put it down!" "Funny, fresh, and self-assured, Your Robot Dog Will Die is a charming, gripping speculative look at the darker side of animal activism. Read this book! Your human brain will thank you." "A wild little tale that dances on the edge of your heartstrings . . . This book had me overcome with feelings of hope, anguish, fear, and inspiration. Arin's distinct ability to capture the world that we are careening toward if we are not careful left me feverishly turning pages in hopes that there is a way to save us all from such a bleak future, a world without our best furry friends. I could not put this book down!" "Satisfying and wistful, with an ending that will thrill every animal rescuer out there. Impossible to put down." 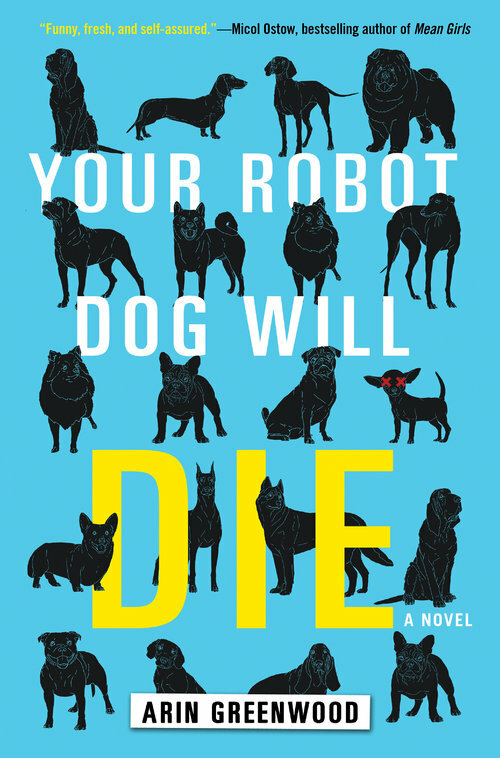 "Your Robot Dog Will Die is a fascinating and well-written novel that will make both lovers of dystopian fiction and animals want to wag their tail." "Arin Greenwood tackles animal welfare challenges like no one has before. Do we save animals? Do we challenge the way things are and have always been? According to Greenwood, the answer is yes. And I could not agree more." "Your Robot Dog Will Die is best read with a warm puppy in your lap. Don't have one? This book will make you want to head to your nearest shelter and pick up a furry companion. Everyone who loves a rescue animal should read this smart YA novel." "This story was definitely different than any others that I’ve read previously."